Christmas trees don’t have to go in the trash. They have many uses. For example, they can be tied to cinder blocks and sunk to the bottom of a lake to create a habitat for fish. ’Twas the day after Christmas, and all through the tree lot, many creatures were stirring and wondering, “What?” What to do with these trees that now have no home? Could we find them a place now that Santa had roamed? But who wants Christmas trees after Christmas, we thought? Lucky for them, they weren’t just going to rot. And, that’s about it for my channeling of Clement Clarke Moore (or Dr. Seuss)! But this truly was a conundrum for San Juan Mountains Association’s incredibly dedicated Christmas-tree lot committee. We sold Christmas trees as a fundraiser for our organization this year and ended up with some left over. We knew the chipper was one option. 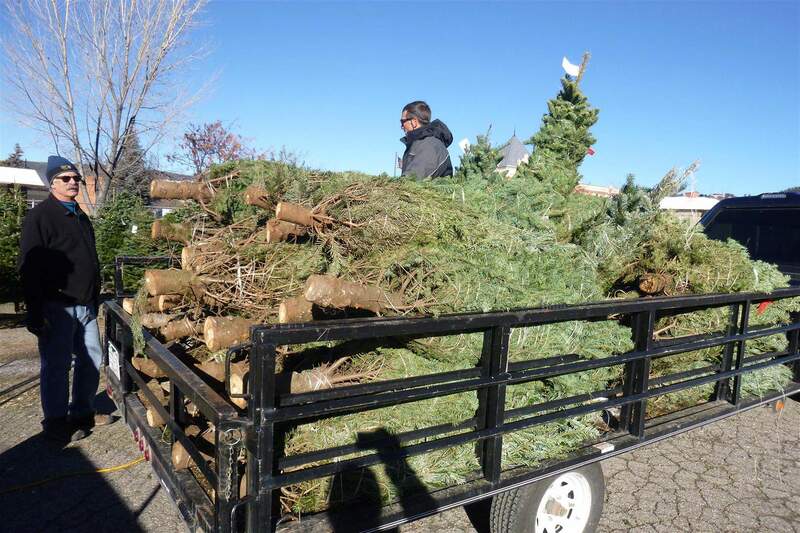 Christmas trees all over the country are brought to designated locations where they are chipped, made into mulch and, oftentimes, offered to local residents. Other “natural recycling” of Christmas trees can happen by finding hungry goats. Christmas trees are high in vitamin C and can even help to de-worm the goats. But what other options are out there? One committee member got in touch with Colorado Parks and Wildlife, and a beautiful partnership was born. Jim White, aquatic biologist with Colorado Parks and Wildlife, was excited to collect our leftover trees for fish habitat in local lakes and reservoirs. Christmas trees are attached to cinder blocks, allowing them to sink to the bottom of the lake. The branches and needles provide cover and protection for the small fry of predatory fish in the lake such as walleye, as well as a place for smaller fish such as bluegill, smallmouth bass and perch to hide. Once the needles are gone, bare branches can still provide decent protection for the fish. It can take about 10 years for the small branches to deteriorate, so these trees will be helping many generations of fish. In our area, the local reservoir in most need of fish habitat is Narraguinnep Reservoir on Highway 184 near Dolores in Montezuma County. If the ice on Narraguinnep becomes thick enough to drive on, the easiest way to put the trees there is to set them on the ice with their weights in the winter and allow them to naturally sink to the bottom of the lake once the ice melts. However, if our current warm winter continues, the trees will most likely need to be brought to the lake in the spring by boat. White will be recruiting volunteers to help with this project when conditions are right. SJMA’s mission of promoting responsible care of natural resources was well-met with this partnership with Colorado Parks and Wildlife. We hope the fish (and fishermen/women) get lots of good use out of our trees! Finally, thanks to everyone who supported SJMA’s second annual Trees for Conservation fundraiser – keep us in mind for next year, too!